Focusing on purpose, process, patterns, and situation in each self-contained chapter, this new edition offers more support, examples, essays, and activities than ever before. 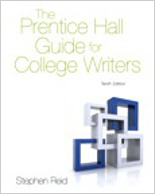 • This compact, efficient guide touches on all the critical aspects of college writing—both personal and academic—within rich, self‐contained chapters. • The high-interest readings by “name brand” authors and the student models, each in both first and final draft, have made this guide a favorite for over 28 years.